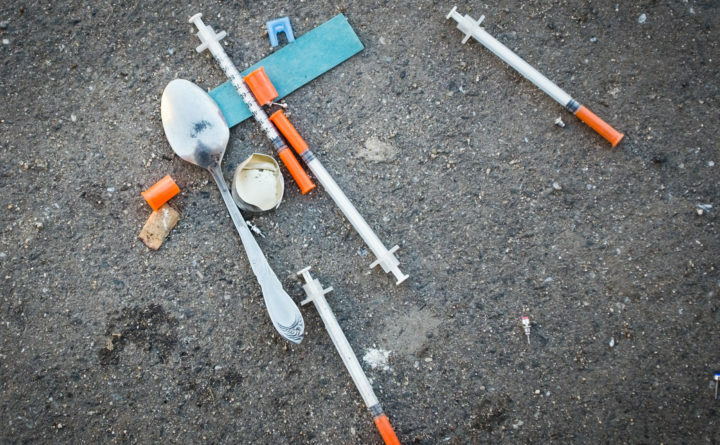 Needles and a spoon lay heaped together on a Portland street. Nine overdoses in four counties on Friday night have police warning the public Saturday about bad batches of heroin. The Hancock County Sheriff’s Department posted a warning on its Facebook page after investigators discovered three overdoses in Washington County and one in Hancock County. None of the overdoses killed the victims, who were revived with multiple doses of Narcan, an anti-overdose drug, police said. “If you have a loved one battling addiction and heroin is their vice, please spread the word and urge caution,” the Facebook post reads. The three overdoses came within 30 minutes of each other and the fourth within two hours of those, prompting investigators to suspect that the users had bought the same batch of heroin, police said. The other five overdoses occurred in Penobscot and Piscataquis counties and are not believed to be connected, police said. The overdoses occurred in Bangor, Brewer, Corinth, East Machias, Franklin, Guilford, Hartland, Hermon and Machiasport, police said. Police automatically assume that heroin that causes these kinds of overdoses is laced with fentanyl, an opioid used for anesthesia and analgesia, according to the U.S. Drug Enforcement Administration. Fentanyl is the most deadly drug typically added to heroin, police said.